Move over, watermelon and cucumber. Fresh, juicy, ripe peaches have taken over my kitchen. 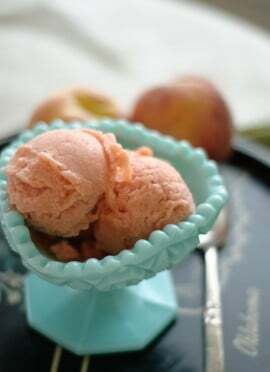 Peach recipes have sweet-talked their way to the top of my list of things to cook lately—so much so that I’ve decided to devote an entire week’s worth of posts to peaches. Welcome to Peach Week at Cookie and Kate! 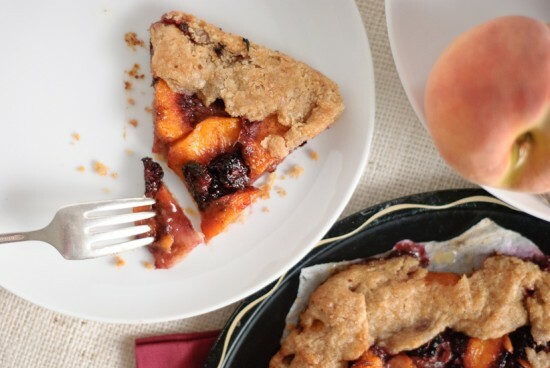 We’re kicking off a series of four peach posts with a rustic stunner, the closest thing I’ve ever baked to pie: the blackberry peach galette. My galette is composed of a flaky whole wheat crust, lots of butter and sweetened with a bit of raw sugar and honey. 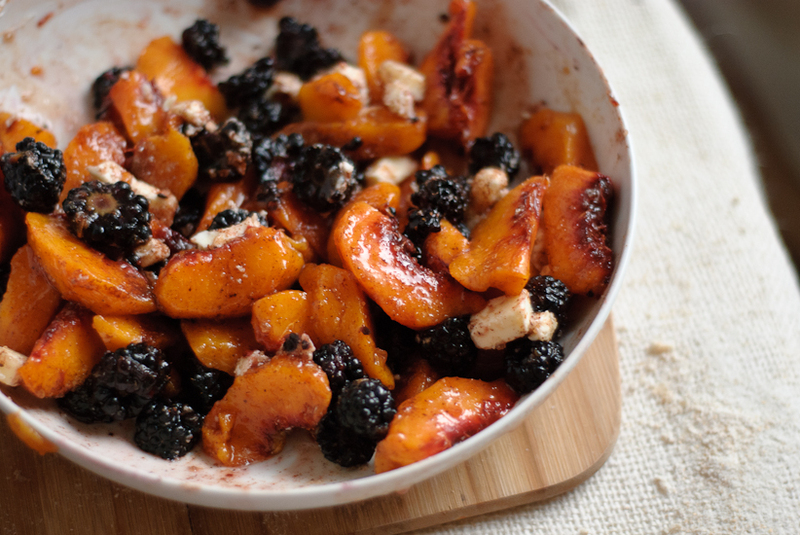 The heavenly combination of blackberries and peaches almost makes up for the intolerable mid-summer heat. Trust me, this recipe merits the use of your poor neglected oven. 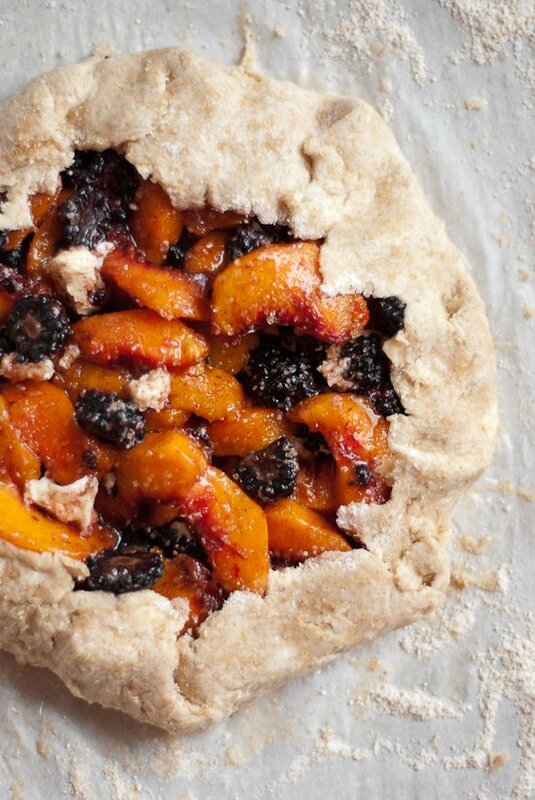 This delicious blackberry and peach galette is made with a whole wheat crust. It’s a beautiful, rustic dessert that’s perfect for summer time! Prepare the crust first, because you’ll need to chill it in the refrigerator. Whisk together the flour and salt in a large bowl. Use a pastry cutter (or a butter knife and your hands) to cut in the cold butter until the mixture has coarse crumbs. Add four tablespoons of ice water, and mix with a spoon until it starts coming together into a workable dough. Four tablespoons was just enough for my dough, but if it still looks dry, add one tablespoon of water at a time until you reach the right consistency. 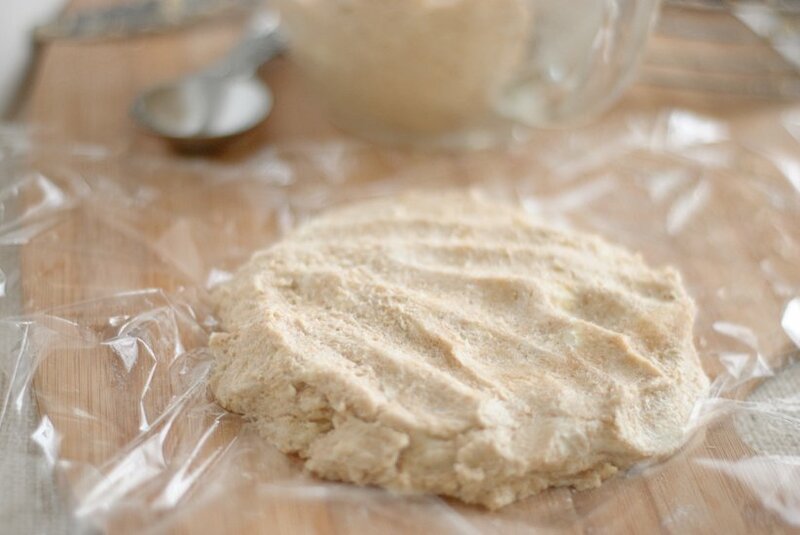 Form the dough into a disk, then wrap it tightly in plastic and refrigerate for one hour. You want the butter to be cold so the baked crust turns out flaky. In a bowl, mix together all of the filling ingredients. Once your dough has been refrigerated for nearly an hour, preheat the oven to 400 F. Line a baking sheet or a large jelly roll pan (the raised edges will catch escaping juices while the galette cooks) with parchment paper. Place your dough disk on a lightly floured work surface. Roll the dough out into approximately a 12-inch round. You don’t want any holes or extra thin spots, though, so don’t stretch it too far. Place the rolled dough onto your prepared baking pan. Add your filling: using your hands, transfer the filling to the center of the galette. 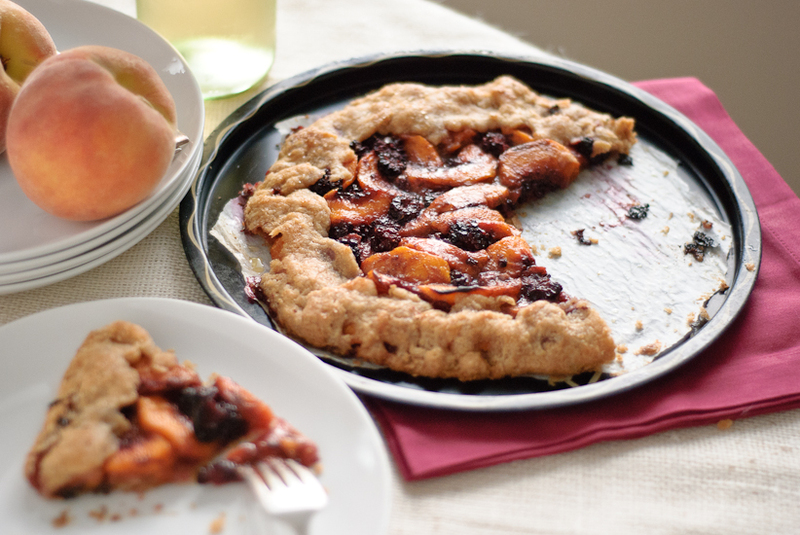 Arrange the berries and peaches into a pleasing pattern, leaving about two inches of crust around the edges. Start at one end and fold the edge over the filling, pleating as you go around. A galette is meant to be rustic, so don’t worry if it doesn’t look perfectly uniform. Use a pastry brush or sprinkle cold water over the crust. Sprinkle a light dusting of raw sugar over the entire galette. Bake 35 to 45 minutes, until the crust is lightly golden. (The original recipe called for 25 to 35 minutes, but my galette took longer than 35 minutes.) 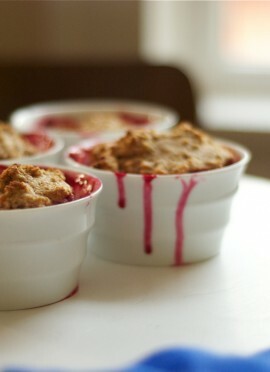 Allow to cool slightly before cutting and serving. 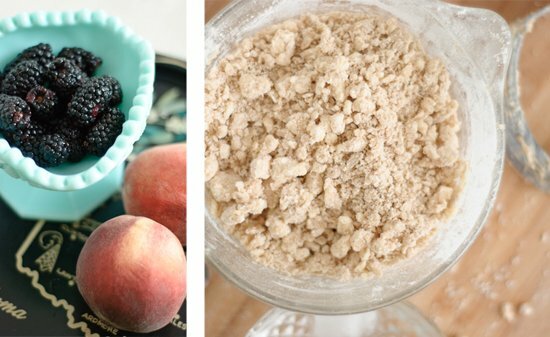 Filling inspired by Roost’s Alabama Peach and Blackberry Cobbler. Whole wheat crust very slightly adapted from Whole Living’s Zucchini Pesto Galette. *Whole Living suggested doubling the recipe and freezing half of the dough for later, which is what I did since I’m eager to try the zucchini pesto galette! Beautiful! I made a galette a few weeks back and it went fast! My husband and I both absolutely loved it. 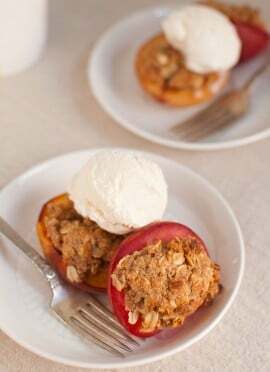 I say yes to peaches and galettes! Happy peach week! Yum! My mouth is watering. Please bring one over any time. I just want to reach into the computer and eat this. Looks great! Absolutely beautiful! My mouth is literally watering. This looks perfect. I love how rustic this looks. Great recipe. Oh my word- beautiful. I’m also having a peach thing at the moment. Clafoutis and salads- I threw some in today at lunch fennel, hazelnuts, leaves and some duck (the benefits of working from home). The peach absolutely made it. I can’t get enough of peaches! Beautiful, site. the colours are gorgeous together. I’m loving the whole wheat crust, too. 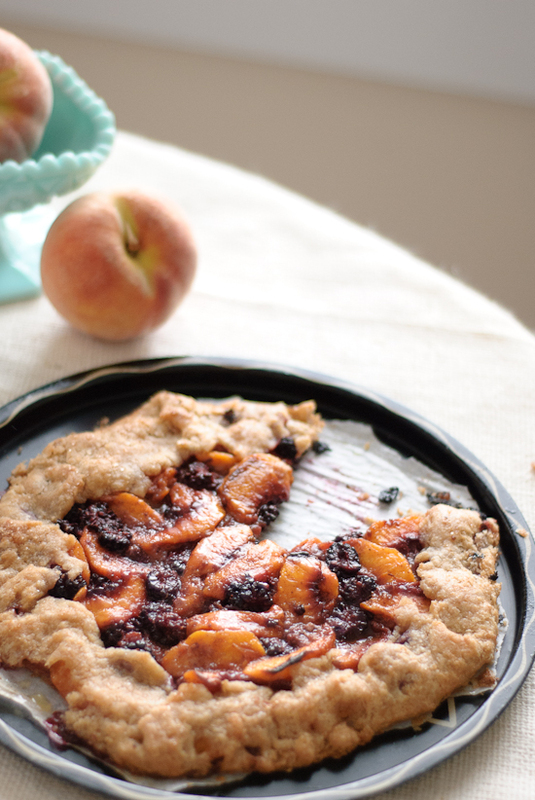 I love galettes, but have not made one that has peaches and blackberries! Yum! Can’t wait to try it. I’ve had a hard time finding whole wheat pastry flour (I couldn’t even find it at Trader Joe’s!). Do you know how this would be with normal whole wheat flour? I was thinking that it might be ok since a galette probably doesn’t have to be fluffy like a cake. I’m sorry for the delayed response, Jenna! I’m also sorry you’re having trouble finding whole wheat pastry flour. I can generally find it at Whole Foods and other health stores. I bet normal whole wheat flour or white whole wheat flour would work pretty well here, though! This looks so gorgeous, and there were still blackberries and peaches at my farmer’s market yesterday! I’m with you on the peaches. I’ve been hitting them hard all season I’m not touching pears until the peaches and blackberries are gone! Thanks for the idea Kate! It was fun to make & pretty, however we probably won’t make again. We didn’t find this to be as scrumptious and indulgent as it looked, but I’m sure for someone who is more into tart pies, this would be a good recipe for them. I think we just have a sweeter tooth. Christine, I’m sorry this galette disappointed. It’s possible that your fruit wasn’t as sweet as mine. You can always add a drizzle of honey to pie-ish desserts to sweeten them up! This looked amazing so I prepared it! With half of the nutmeg and still soo strong. I’ll explore more, without nutmeg, thinking of what I could add as spice. The dough is delicious, but next time i will prebake the bottom or as my (baker) husband suggest, scramble some ladyfingers in the mixture to absorb the juice… Anyway, it came out of the oven 4 hours ago, its almost gone, and we are just 2 :).